The continent of Asia, by the standard definition delimited by the Urals. a proposed Aegean language family word "asis", meaning "muddy" or "silty", in reference to the silty eastern shores of the Aegean sea. A continent located east of Europe (typically delimited by the Urals), west of the Pacific Ocean, north of Oceania and south of the Arctic Ocean. (Greek God) A daughter of Oceanus and Tethys, the wife of the Titan, Iapetus, and mother of Atlas, Prometheus, Epimetheus and Menoetius. (astronomy) 67 Asia, a main belt asteroid. A female given name of modern usage, from the continent. And Scott Haskell started going out with this sophomore girl called Asia, who was this rich girl from Weston Heights. 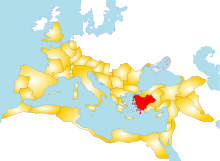 (historical) A province of the Roman Empire located in what is now western Turkey. Borrowed from Ancient Greek Ἀσία (Asía).